The Singularity Deck - Earth Full Set contains six suits: spades, hearts, diamonds, clubs, triangles, and ovals. 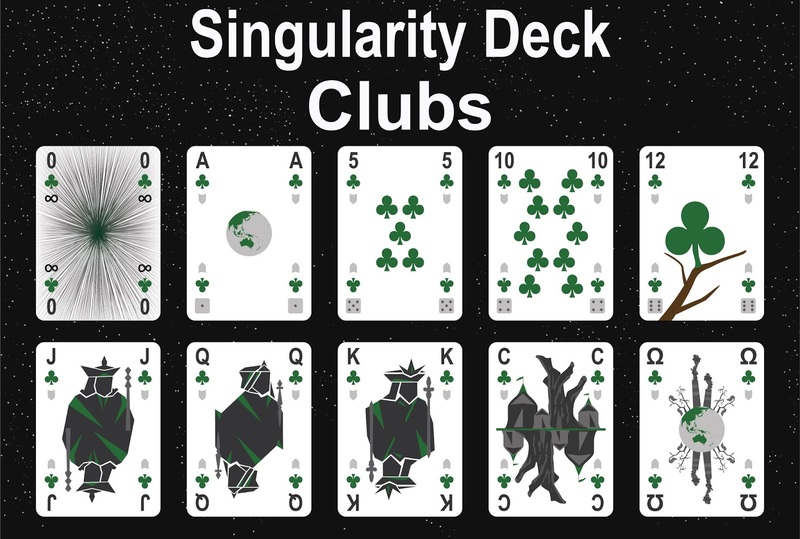 Each Suit contains all standard playing card ranks (A thru K) plus a few extras including an 11 & 12, a singularity card, a City card, and an Ω card. They each include three copies of the A-rank and one copy each of the other ranks, for a total of twenty cards (A,A,A,2,3,4,5,6,7,8,9,10,11,12,J,Q,K,C,Ω, and singularity) per suit. Each suit begins with the alpha card and ends with the omega card, which depicts an earth wide catastrophe associated with each suit. The alpha cards can be put together to make a time-lapse of the earth’s rotation. 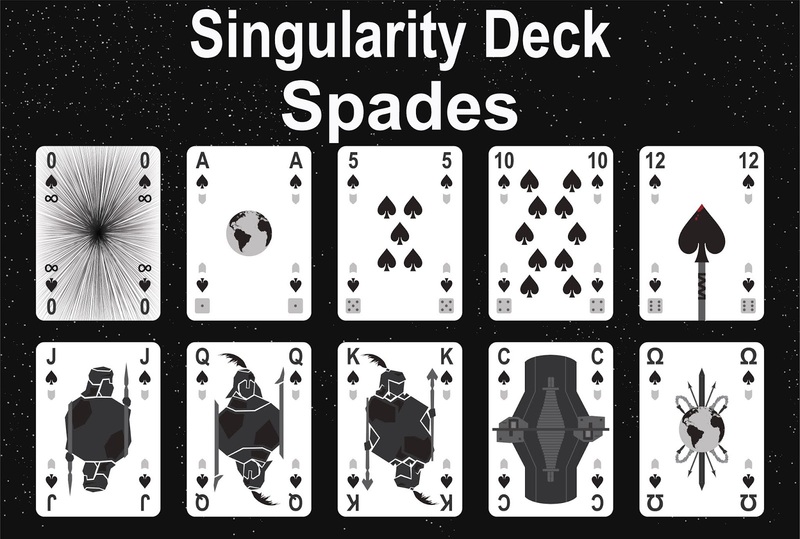 The namesake card of the deck, the singularity card, is ranked both zero and infinity and stands outside of the other ranks. * why three A per suit in the deck? * why T(ower) and not C(ity) in the Cosmos deck? It would have been better to have both T and C for every suit and not three A. * It seems that the pips are now bigger. Please confirm. If yes, this is quite good because on my version they are too small and do not contrats enough with the indexes. * Why removing the 1? A 1 with the normal pip size (like in my K6T) would be good. (Instead of one duplicate A). Last minor critic. I regret that the pips are all oriented the same. Modern decks have some pips oriented to top other to bottom. You have a nice symmetric back, it is too bad that all pips...See more are oriented in the same direction. One can immediately understand the opponent has a heart or a spade and not a diamond or a circle. Thanks for the questions and I'm glad you like the new art. The shield icons are there to indicate suit pairings. For example, in a standard deck of cards hearts and diamonds are both red. 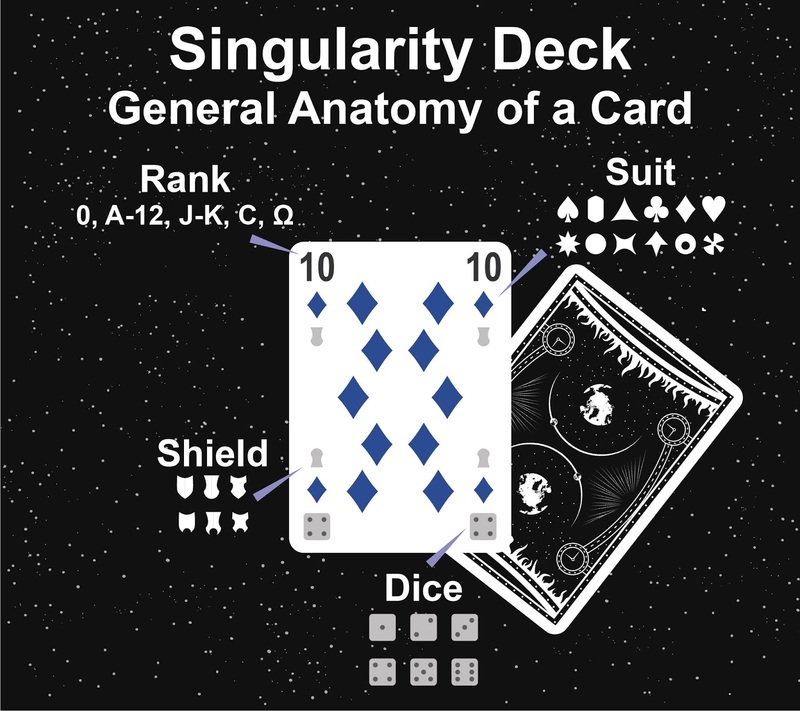 Since each suit in the Singularity Deck has it's own color, the shared shield icon indicates their pairing. The shield icons are based on logic gating symbols and can also be used for grouping between the earth and cosmos sets. The dice icons are there to allow for the playing of a handful of games that require doubles of specific ranks (for example the game Hanabi). In the original design, I just had multiples of certain ranks printed, but for the new design I wanted to not have to carry around duplicates of cards and to simply flip the cards over. Despite not wanting duplicate cards in the deck, some games still required multiple aces, which is why their are 3 of each. This included games like skull and lost cities. That is also why I removed the 1 card, since I felt it was a bit redundant. If you...See more found the rank 1 card useful though, I'd be happy to make a separate set of cards with rank 1 cards for each suit. Just let me know if that is something you'd want. 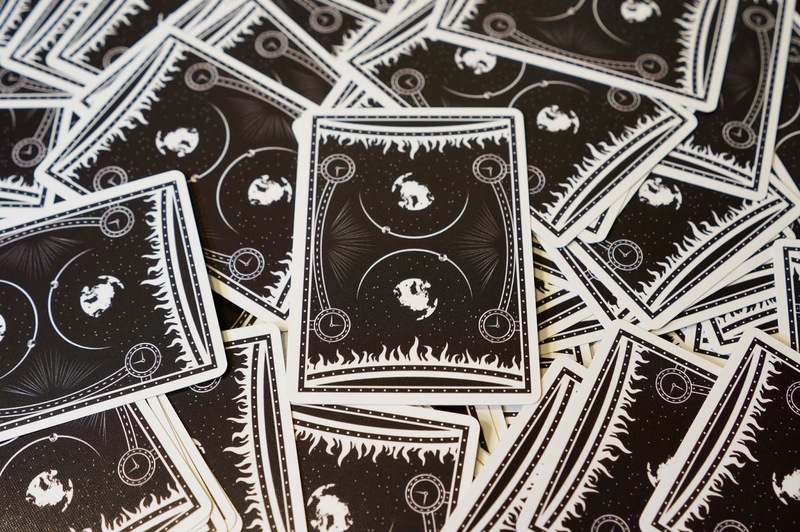 The pips are bigger than in the first version of the deck for the reasons you described. I wanted a bit of asymmetry between the cosmos and earth sets which is why one has a C card and the other has a T card (not a super great reason, honestly). Given that the new deck has two sets of ranks (the standard numbers and the dice pips), most of the time only one is being used, which means that the cards will need to be oriented towards the rank being played with regardless of suit. I agree with your criticism about the lack of symmetry in the first deck. I'm not sure some people would consider this one an improvement in that regard, but at least with this version of the deck all of the card fronts are asymmetrical, which means that it is equally likely that any suit would be rotated once in a players hand. Thanks again for the comments. I originally designed the deck for myself, so getting peoples feedback on what they want has really helped me improve it. Dude, I really love where you were going with these cards. They've given me a lot of inspiration on a story I've been working on and I wondering if it was alright to use the majority of their concept for that story, as they fill a lot of the gaps I was having a problem with. The info on your site was really helpful in envisioning the technical stuff. It would be cool if you could let me know. Hi Joe, You are absolutely welcome to reference the deck in your story, regardless of whether it's just conceptually or specifically. I'd love to read it when you're done. If it helps, the iconography and card back are free to use (you can download them on my site), so you are welcome to include the graphics if you planned on including any images in the story. Publisher website says there are plans to expand to 12 suits. Any estimate yet on when that might be available? 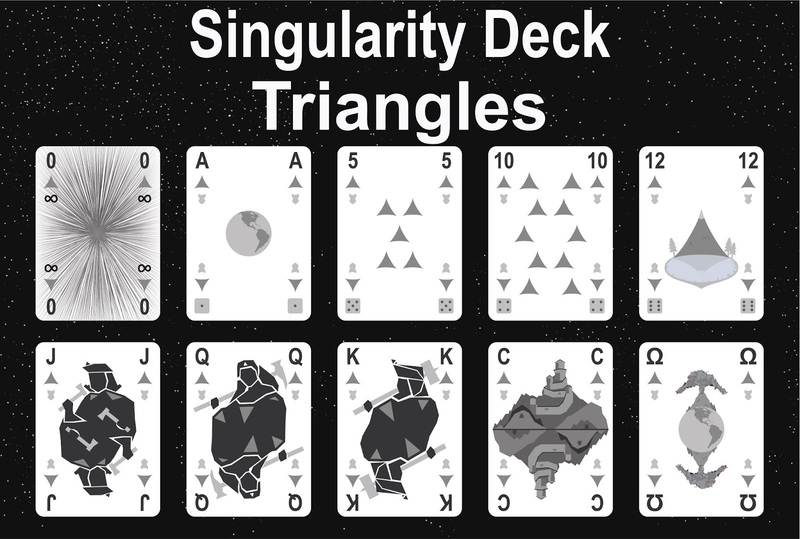 Would also like to see the number cards provided to higher than 12 as one of the games I use the Singularity decks for requires 24 cards per suit. Disappointed that is no longer available at this point. Hi David. Sorry, I just saw your comments, otherwise I would have responded sooner. I'm working on updating the other suits. I have the star suit ready to go. My plan was to release the extra suits one at a time as I finish them. I honestly didn't know many people liked the extended rank cards, since I only sold a couple. I'd be happy to update them to the newest back. If you have any other ideas for the cards I'm interested in hearing it. Thanks for the reply. The extended ranks are really what set these apart from other decks. Without those they are just another deck. I find I can get people to accept 4 different suits than the standard suits. But getting them to play with more than 4 suits has proved to be a challenge. People are just too trained to play with 4 suits. But has not been difficult, especially with the 5 and 6 player spades games I have developed additional number cards per suit has been an easy sell with the group. Once you have 4 suits in the new backs with extended rank numbered cards sufficient to give me 24 cards per suit I will definitely be pulling the trigger and buying. Cannot promise volume but am interested in purchasing at least two, possibly 4 to 6. Hey David, The extended rank set has just been posted: http://www.drivethrucards.com/product/191478/The-Singularity-Deck--Earth-Extended-Ranks . It increases the number ranks up to 24. I hope you like it! Without the associated extended ranks deck this deck is fairly worthless. It was that ability to take the numbered suits all the way to 20 that made the Singularity so flexible and powerful and made possible some fun customized games. Please bring it back. And while you are at it bring back the space deck and make all 3 in the singularity set with a new updated back so the decks are more difficult to get mixed up. Have bought a few of these. Would have bought more. I am very disappointed however to find the companion deck that gave you extended cards in each suit going up to 20. This earth deck without that companion deck is of limited value. This title was added to our catalog on August 15, 2016.